Monty and Caitlin are both are CPE (Community Preparedness Education) presenters. Monty is also trained to work in the Shelter and as a DAT team member. Their passion is meeting with communities, discussing their plans, and addressing their needs surrounding disaster preparedness. What better way to this then as a father/daughter team! Q: What drew you to the Red Cross? Monty: I wanted to give back to the community and help other become knowledgeable about how to deal with natural and manmade disasters. There were just too many people not know where to turn and some that weren’t taking it seriously. Getting the message out there seemed like a natural calling since my previous life dealt with life safety at a local coffee company…Starbucks Coffee Co.
Caitlin: Well, I wanted to be something more than just a victim in a major event. I wanted to be able to help when others were in need. My first step was learning First Aid, my second step was joining my Papa teaching disaster prep alongside my dad at the Red Cross. So here I am! Q: What keeps you volunteering with the American Red Cross? Caitlin: Learning to become more mature with a group that is helping people. It’s a big responsibility being a volunteer, but with that comes pride. Pride in knowing that when my friends are running, scared, or hurt, I may be able to help or guide them. The skills I gain will also help me later as I grow older. Q: What do you get out of being volunteers? Both of us get a sense of pride and achievement that what we are doing is actually helping. Not everyone likes to discuss this topic, but when they see a family (us) meeting with them to discuss our own plans while helping them develop theirs, it makes sense in most people minds that this education is important. Our favorite part is when we see that someone has learned something and takes a new knowledge tool home with them. That gives us confidence that at least one person (if not more) will have better odds at surviving a disaster. Monty and Caitlin need your help! Join them in their efforts to prepare our community for a disaster. 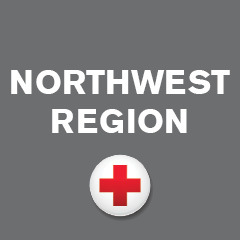 Sign up to become a Red Cross Volunteer.